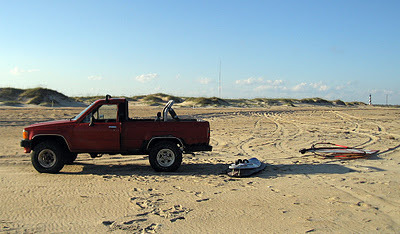 Bill's OBX Beach Life: Return of Warm SW and the First Trek to HI Since Reopening of Rt 12! Return of Warm SW and the First Trek to HI Since Reopening of Rt 12! Late last week and throughout the weekend we experienced a return of warm south westerly winds and perfect beach weather on the OBX! I made my first trek south to Hatteras Island, since Irene's impact, to catch Hatteras wavesailing at both Ramp 34 just north of Avon and Lifeguard Beach near the Cape Hatteras Lighthouse in Buxton. The first sesh was at Rmp 34 and I joined Keith and Rick for some fleeting surf in near offshore conditions as the winds clocked WSW. I was there a little late for the party as Keith reported better conditions earlier in the morning while the wind remained more southerly and the surf was a little bigger. I launched with a 2 mil top and trunks and the water felt great hovering just over 70 degrees! With the near offshore setup, we were running near parallel to the beach and I did get into a few small waves, but nothing to write home about. As the winds dropped by mid-afternoon, we packed it up and I decided to head down to Buxton to check the Point area. 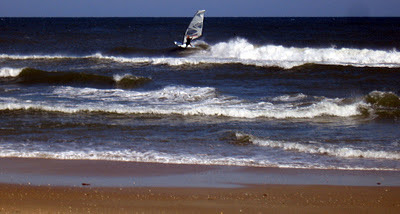 Winds seemed to return and I launched at Lifeguard Beach and experienced an awesome sesh! The surf was breaking outside and though size only ranged waist high, the lineup was really nice and the swell definition was well set. Additionally the water was near perfection with a deep blue/hint of green Caribbean color and clear as glass. I could see tons of cannon ball jellies swimming below as I sailed out and porpoise jumping and frolicking in the surf zone. 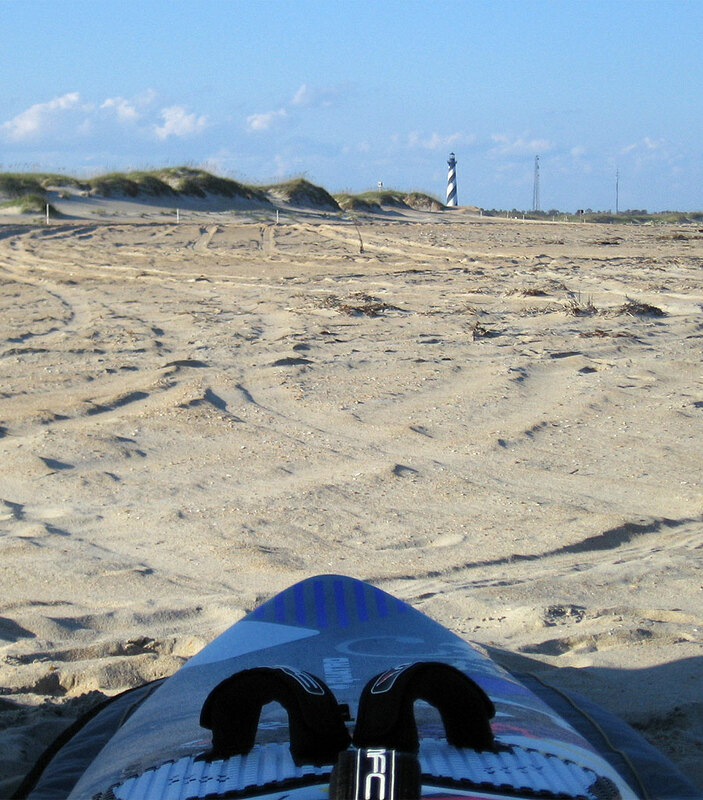 Clear sunny late day sky and warm air and water made for a magical Hatteras wavesailing experience where the moment was simply being out there. I was solo for the session which lasted about an hour as I caught wave after wave in the surf zone just offshore of the turtle nesting restricted zone on the beach. Nice thing about that area is that there is a nice sand bar there and no fishing lines since no one can be on the beach in that area. All in all, its great to have Rt 12 reopened with now the ability to catch those surf sessions "down south." I really did not know how much I was missing until I was "cut off," though now its great to be able to run down there again when the wind and waves are ripe! PS: the 25mph zone where the new bridge spans is quite short and really is no impact on the time frame to make it down there. Are you alive? Ever since the Windsurf Magazine black hole sucked up Andy's blogging creativity you've been the sole source of OBX action. It's fall, what's up? BTW, heading down on 10/11 for a week or so. Hope to see you on the big blue wet thing! hey Ken, yea still alive! However, with the Irene shutdown of HI and limited treks due to lack of sleep from the little ones, I am way off par for where I am normally this time of year. Its been super windy recently and big surf. Hoping to head out tomorrow and perhaps down to the south side if it looks doable?! Already missing the warm trunks only though as we are now seeing temps (both water and air) drop considerably. Oh well, hood/vest and booties can be packed too! yea, hope to see out on the water when you are down! c'mon Bill...I need an OBX fix (digitally). Make me jealous! You gotta be kidding me Bill. Almost two months w/o a post? Damn, amazing its been that long! Yea, not really have had that much exciting windsurfing experiences to post this Fall. Had a few sessions, but mainly light air or road sailing only. 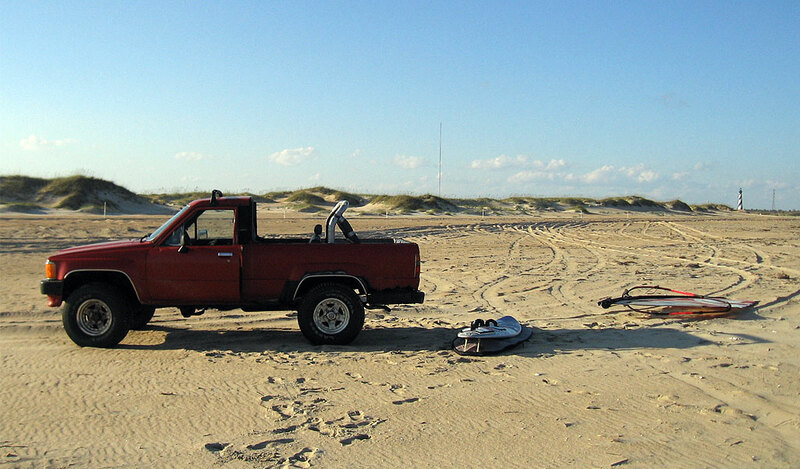 Gearing up though for the upcoming NE and hopefully Ocracoke run?! At least, Fall 2011 is not locked in a "Deep Freeze" as was the case following Dec 1, 2010 last year! I haven't been able to sail or paddle in ages due to injury, but that doesn't stop me from posting regularly. Surely I should chatter less, but you sir should post more!